Yes, our 5 field teams: the Red, Purple, Blue, Yellow and Green teams have been sampling lakes from Ontario to Nova Scotia for a month. In the map below, we show the travel routes for each team. The teams are traveling at the same time, but some teams will continue for longer than others: from 6 weeks for the Purple team to 10 weeks for the Blue team. 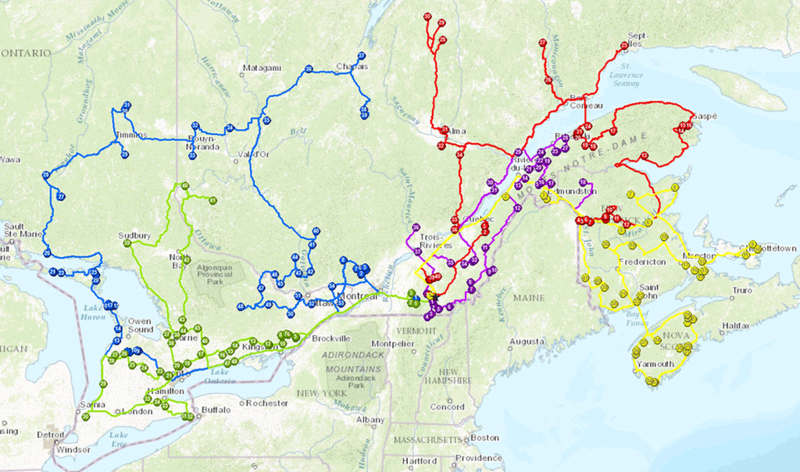 Each route covers a different part of eastern Canada. In each team, everyone has special roles: the dissolved gases person; the water and filtration person; the optics person; the sediment core person, etc. Image at right: Our field warriors display steely determination, razor-sharp wits, and a pinch of goofiness. Just before their departure, we held a training workshop where the field teams were trained like astronauts. Well, it took a little less time because our training program is much more efficient than NASA’s. But it was intense! In 3 days, they were ready to go! 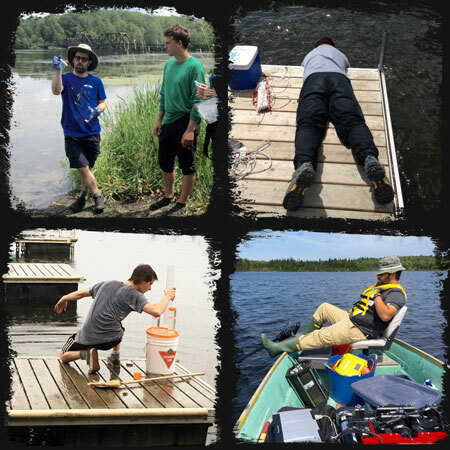 Image at left: Catching influenza viruses on the shore (top left); catching methane bubbles off a dock (top right); hopefully not catching a cold in the rain while rinsing sediment core tubes (bottom left); catching lost sleep in the middle of a lake (bottom right). 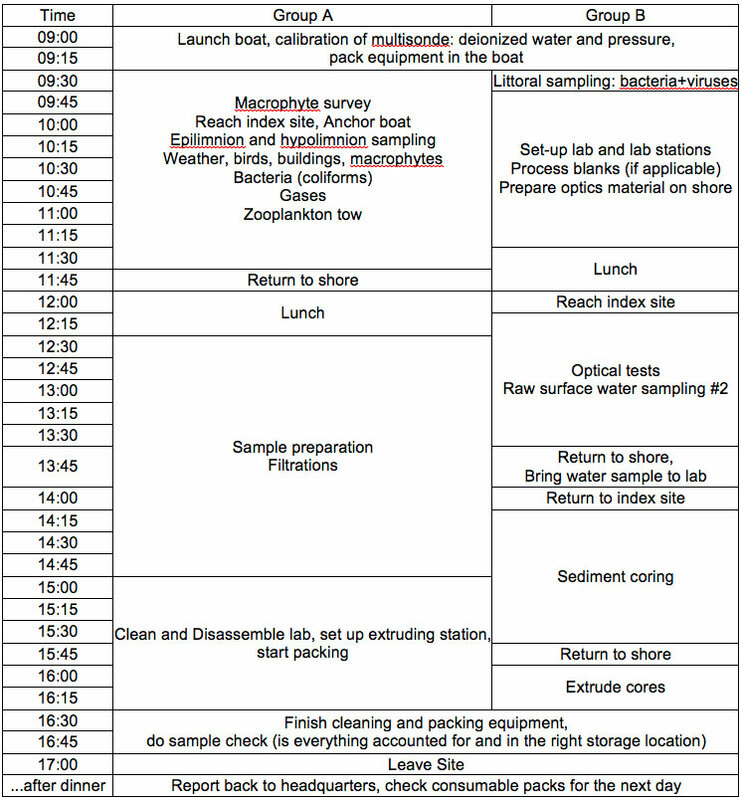 Our field teams follow an intense daily schedule (shown below) to collect a wide range of measurements. At each lake, the 4-person field team divides into 2 groups to get everything done. Not a minute is lost. 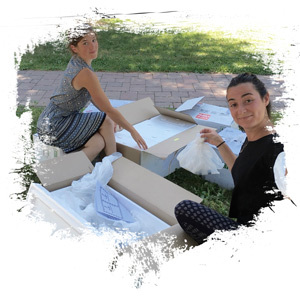 Each week, the field teams carefully pack and ship their samples to the Université de Sherbrooke. There, our logistics team unpacks and ships 1000s of samples to other labs; they also send fresh supplies back to the field teams. The field teams’ fun photos show the highs and lows of their adventures. Make no mistake, this is hard work! They have incredible energy and determination. But, we’re all determined as we believe Lake Pulse will provide a great leap in our understanding of Canadian lakes. Our research will help to explain the impact on lakes of human activities, such as land use changes, contaminants, urbanization and climate change. In the map below, you’ll see how we selected this summer’s lakes based on their size and the level of human (but we’re keeping the easternmost and westernmost lakes for next year…). The hard work is already paying off! Just this week, the first samples were analyzed at the Université de Québec à Montréal (UQAM). These exciting data show… whoops, I’m straying into a future blog post! Before I get ahead of myself, let me share our 4 biggest challenges over the past few weeks. Challenge 1: The sheer numbers in Lake Pulse! 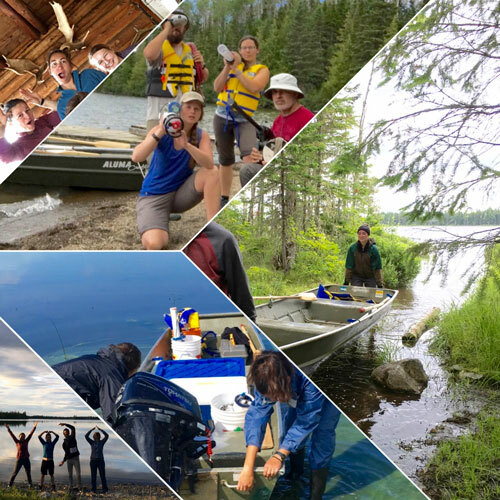 None of us have ever sampled this many lakes in different provinces with so many sampling teams simultaneously – some have called it “crazy”, others call it “historic” (our field teams prefer “heroic”). 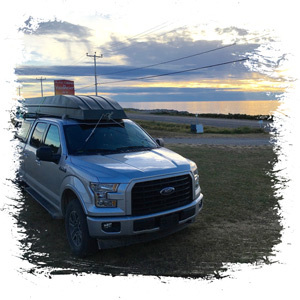 Typically, our experience comes from sampling fewer lakes in a single province. For example, a large sampling program carried out by a research lab might include 30 lakes with about 25 samples for each lake. By contrast, Lake Pulse will visit about 220 lakes this summer and collect samples for over 150 variables at each lake! To do this, we have 5 teams with 4 people each who are traveling with a massive amount of material. Efficiency is essential, and this requires careful planning and extensive preparation. The sheer number of bottles, filters, vials and other sampling paraphernalia is mind boggling! This summer alone, we are using more than 22,000 containers. Many of them are acid washed (and triple rinsed) by hand to make sure they are squeaky clean (they really do feel squeaky after an acid wash). 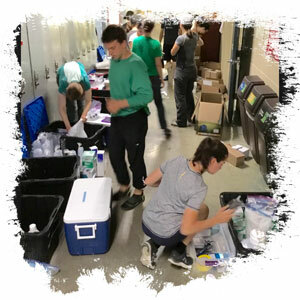 To prepare the mountains of supplies, many people have been hard at work: summer students, the field coordinator, the geomatics specialist, and even our director (and anyone he can drag in – see image at left – no, this isn’t child labour, they are happy volunteers preparing sampling bags… for an ice cream bar). Then, all of these items are meticulously packed according to sample type, which helps the field teams keep everything organized. During the training workshop, the teams also organized much of the material required for their expedition (see image above at right). The incredible variety of samples collected by our field teams will be studied by 18 researchers and their students across Canada – no single scientist could ever collect and use this much information for such a variety of lakes. Detailed methods on how to collect the samples are described in our field manual: 109 pages of instructions. Perfect bedside reading (works better than counting sheep)! Each sample collected must be carefully labeled: yep, this also means 22,000 labels! If the teams took 30 seconds to label each sample, they would spend 183 hours labeling bottles, which is almost 20 workdays (for a 9 to 10-hour workday)! Maybe, if all our team members had clear handwriting, it wouldn’t be so bad, but they DON’T! Luckily, our database specialist, Jelena Juric, can perform miracles in her sleep (actually, a little bird told me that she drastically reduced her sleeping hours to do this). She made a little database; wrote a bit of code; and (drumroll, please) 22,000 labels were printed! They are ordered by lake and sampling time, and they match the identification code in our electronic log sheets. In the image at left, the Purple team is not losing a second! They are preparing labeled containers in the back of the truck while driving to a lake. Go Purple team! 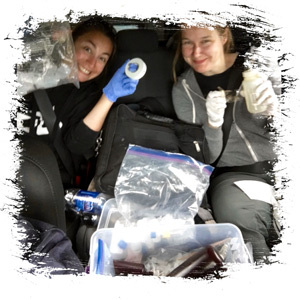 Each team manages a mobile lab including a pick-up truck, trailer, tent, boat and an incredible array of equipment and supplies. Every week, our field teams send about 30 litres of lake water (much of it must remain frozen) to the Université de Sherbrooke for distribution to different labs in our research network. 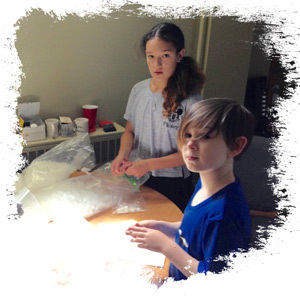 We must ship dry ice (solid carbon dioxide used for refrigeration, which sublimates at –78.5°C) to the field teams, who are sometimes in remote locations. 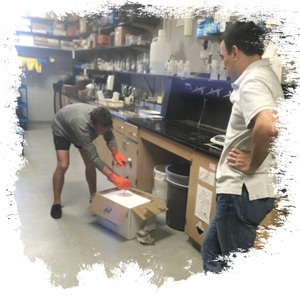 Once they receive the dry ice, they can quickly pack and ship their refrigerated samples. But, figuring out where to send the dry ice and other urgent supplies involves tricky logistics – our teams don’t always know exactly where they’ll be and when! Big thanks to Odile Couture, at the Université de Sherbrooke, who harassed shipping companies for weeks to help us plan all this! Lake Pulse nomads (images above) are hosted at various institutions: They have been given space to chop up dry ice in a Queen’s University lab (left); pack samples at the University of Moncton (middle); and on the road again (right). Rain or shine our field teams are out there. They make incredible efforts to sample 1 lake per day in all conditions. Of course, there are reasonable limits; crazy hailstorms are one of them (see video below)! Amazingly, this team still managed to finish most of their sampling! Go Yellow team!! An unexpected inconvenience for many teams is that our field work requires NOT wearing deodorant, drinking coffee or applying mosquito repellant before taking water samples (we waited until they agreed to participate before mentioning this detail… but now that this is public, we’re worried about our recruitment prospects…). Some samples are so sensitive that these precautions are needed to avoid contamination. On the bright side, this allows us to obtain cutting-edge measurements of tiny amounts of chemicals in lakes. 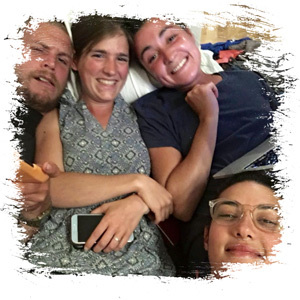 This is really cool, so we thank our field teams for sacrificing their creature comforts (but we are thankful that a few 100 km is separating their bodies from our noses)! Our teams are expected to sample 1 lake per day for 5 to 6 days per week. Sampling this many lakes requires knowing how to efficiently find and get on a lake while always ensuring safety. 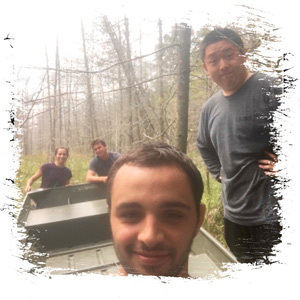 For 2 months before the field season, we had 4 students intensely preparing “lake packets” (yes, their summer job started as a boring desk job, but now they’re testing their good work in the Canadian wilds). These packets provide teams with information on the lake (such as size, location, and bathymetry if available), access information and emergency phone numbers in the area. By far, the hardest thing is obtaining access to lakes. In fact, for half of the selected lakes, we have not been able to confirm access. Consequently, teams must figure out how to access a lake once they arrive on site. 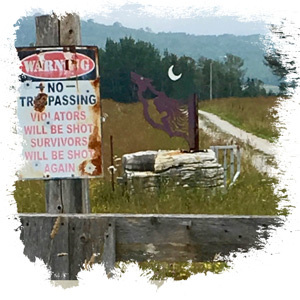 Generally, access issues are not because a lake is physically inaccessible (if you read our previous post, you’ll know that we selected lakes that are relatively close to roads). It is simply because, for many lakes, we need a lakefront property owner to let us access the lake. This usually works out well as someone is generally willing to let us set up our mobile lab (a tent) and access the lake from their property. Sadly, sometimes it doesn’t work out. It turns out that, though uncommon, some people don’t want us to access lakes (see image at left). “Something there is that doesn’t love a wall,” Robert Frost wrote… when later in his poem he refers to Elves, we suspect that he really meant “Green team”… or at least that must be how they’re feeling after being refused access to several lakes. Keep going Green team! The worst excuse we heard so far: “If people hear about ‘our’ lake through Lake Pulse, they might start coming to ‘our’ lake.” But, the anonymous “No Trespassing” sign can also be a real downer. 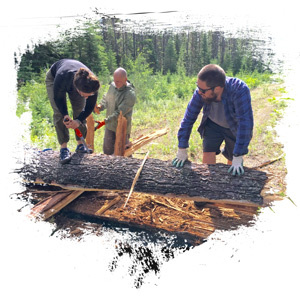 Our Red team found such a sign AFTER they had cut through a fallen tree (using a 20-cm pruning saw; see image at right) to reach a lake. Just before that, they had tried to access 3 alternative lakes (i.e., alternative lakes were pre-selected during the planning stage, just in case teams couldn’t access their target lake). With nobody to permit access to the lake, they had to leave. But, we admire their determination! Go Red team! 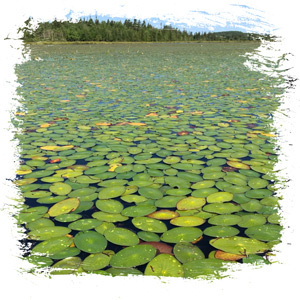 To carry out a cross-country assessment of lake health, Lake Pulse has carefully selected 680 lakes to represent the vast number of lakes across Canada: large and small, pristine and polluted. The samples taken by our field teams at these 680 lakes will be used to develop a better understanding of lake health across Canada using tools such as satellite imagery and computer modeling. To us, if your lake is sampled by a Lake Pulse field team, it is like winning a lottery! This is a rare opportunity to learn more about your lake based on the in-depth sampling done only for these 680 lakes. However, if your lake was not selected among the 680 “representative” lakes, you can still benefit from the web-based tools that we are developing to help Canadians better monitor the health of their lakes. The best thing would be to make sure that you have some kind of lake monitoring program in place. This will help you to make the most of our tools in the future. We want to make lake health monitoring an easier task for everyone. This will benefit people across various sectors, whether you are a cottager, farmer, lake manager or a mining company. Lakes respond to changes occurring throughout their drainage basin because of their special role as the recipient of water flowing through the watershed (along with the contaminants it contains). Many lakes and aquatic ecosystems are showing signs of change. To better manage these resources, we need to understand how to mitigate our impact on these natural systems. In Lake Pulse, we are tackling this issue at a very large scale – a Canada-wide scale – in order to provide our diverse partners and all Canadians with better information about lake and watershed health. By better understanding the main stressors on lake health, we can address how to be more efficient in protecting and conserving our lakes. Every lake has something special to offer… but some, though beautiful, make sampling a bit more tedious (at right: interesting lake conditions; at left: a forest hike with a boat before finding a lake)! Good luck to our field teams! Safe journeys! They’ll even give you a Lake Pulse pamphlet if you ask nicely! Read our other blog posts!